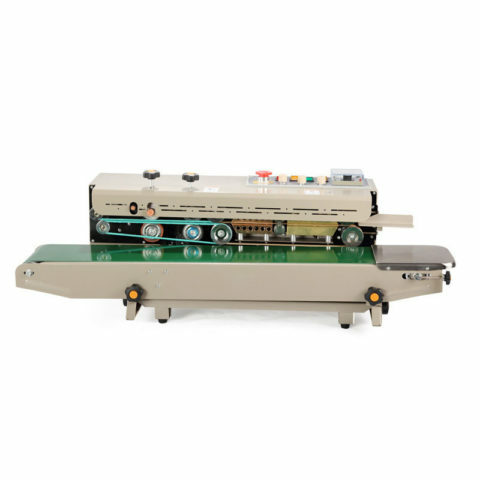 Continuous bag sealer adopts electronic thermostat control and automatic delivery device. The machine can control a variety of different shapes of plastic film, can be used in a variety of packaging lines. The sealing length is not limited. Continuous bag sealer machine can be equipped with embossing wheel and printing wheel, with the need to change the font type, can be printed the dates of manufacture and shelf life on the seal. The sealing pattern and the printing is clear and beautiful. Sealing and printing can be done once. Date, batch number as needed replacement, easy to use, in line with the provisions of the food hygiene standards. Continuous bag sealer machine is suitable for the sealing of aluminum foil bags, plastic bags and compound bags in the fields of medicine, pesticide, food, daily chemical and lubricating oil, etc. The continuous bag sealer machine has the advantages of strong sealing effect and high efficiency; the structure is simple, compact and small in size; Beautiful, advanced technology, low power consumption; easy operation and maintenance advantages, is an ideal sealing machinery. The continuous bag sealer machine can also horizontal and vertical: horizontal use of dry goods packaging seal; vertical for liquid packaging and sealing. Application: Plastic Bag, Plastic Film, Plastic Pouch. Image Description: Continuous Bag Sealer Sealing Machine Dimensions.